Join us for the Grand Opening of Reverb at the GM Centre on 1 June at 7:30pm! Reverb will be installed in the spring of 2015, adjacent to the General Motors Centre (GM Centre), Durham Region’s premier sports and recreation facility, and the venue of the boxing and weightlifting events at next year’s TORONTO 2015 Pan Am Games. The work was purchased with the financial support of the RMG Acquisition Fund and the Canada Council for the Arts Acquisition Assistance Program. 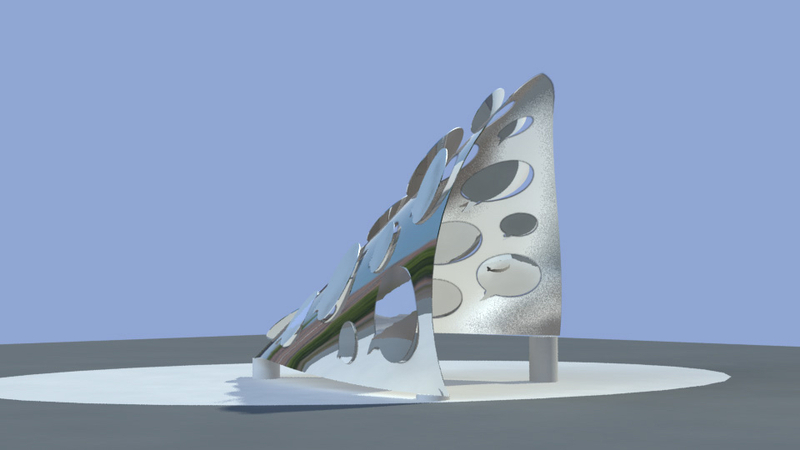 The sculpture is impactful, standing at 19’ high, and will become a meeting place. The curved form implies a megaphone, an amphitheater and stage, a net or goal, as Reverb reflects the activities that occur in the GM Centre. The ‘blurb’ shapes on the structure represent the fans and are positioned like a rake of seats. Projections of coloured light will be created in the sculpture when sounds inside activate lights within the steel structure. Reverb is full of meaning and references. 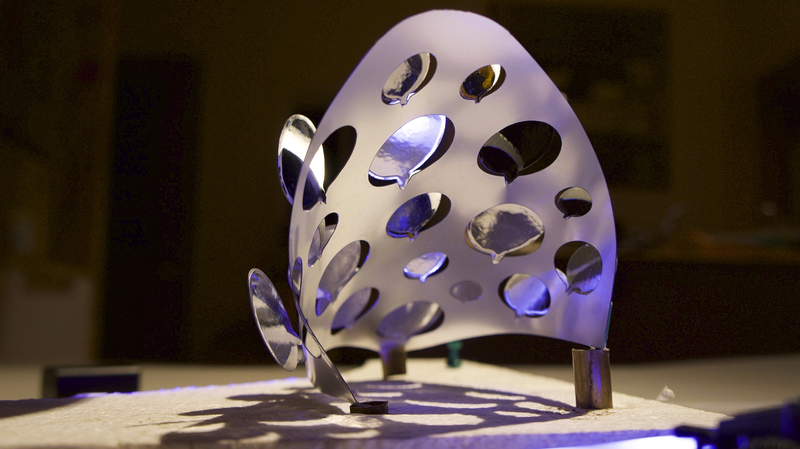 The laser cut stainless steel references industrial production and the facets align Oshawa’s history as a port city and as an industrial capital. In addition to celebrating the City’s participation in the TORONTO 2015 Pan Am/Parapan Am Games, the project will reflect narratives that have meaning to the community and the public space that the work will occupy. The work will also respond to the RMG’s statement of purpose: Dedicated to sharing, exploring and engaging with our communities through the continuing story of modern and contemporary Canadian art. This new work becomes the fourth sculpture commissioned by the RMG, and will be added to the RMG’s permanent collection of over 4,500 works. Recent public art commissions include Douglas Coupland’s playful Group Portrait 1957 installed on the façade of the gallery in 2011. The commission installation is set to take place in early May, 2015 and the RMG will be posting updates about the commission as it develops. Follow #Harding2015 and #Reverb2015 on Twitter! As an artist, Noel Harding produced video art in the 70’s, video projection and installation in the 80’s, kinetic installations and sculpture as theatre in the 90’s. His work for the last 20 years is in public art where landscape and environment are paramount. In general, his work is an engagement in public urban realities: planning, envisioning, and mapping. He has exhibited and lectured internationally and his work is included in collections at the Vancouver Art Gallery, the National Gallery of Canada, the Art Gallery of Ontario, the Museum of Modern Art in New York, the City of Amsterdam and the Hara Museum, Tokyo. Sam sat down with Noel Harding, the commission winner, to discuss his project “Reverb.” Noel received the TORONTO 2015 Public Sculpture Commission at the GM Centre: a site-specific sculpture commission in collaboration with the City of Oshawa, in celebration of the City’s participation in the TORONTO 2015 Pan Am/Parapan Am Games. The sculpture will be installed in the spring of 2015, adjacent to the General Motors Centre (GM Centre), the venue of the boxing and weightlifting events at next year’s TORONTO 2015 Pan Am/Parapan Am Games. Join us for the unveiling ceremony on June 1st at 7:30pm. The RMG: How did you become an artist? Noel Harding: I always admired artists but never thought I would become one. It was almost by default. I left high school at 18 (achieved grade 10) subsequently working for my father’s engineering firm until I decided I had to do something with my life. I went to trade school, became an architectural draftsman, then an architectural construction technologist. I was employed as a construction estimator for which I was readily fired for lack of interest. I landed at university as a mature student studying philosophy and working in the university video studio part-time. My involvement with video expanded from running cables, to camera operator, to tv studio director and educational script writing. Without really thinking of myself as an artist, though jealous of such, I decided to create something in video and submit it to the university’s competition for art works. To my surprise, I won first prize and my resulting video works started to travel to many different countries. In that time, video was a brand new medium – so many things had never been done before and it was a great realm to work in. However, I never like making the same thing twice. After a while, that little screen, that shape, it was just boring. I didn’t look at it like storytelling because I treated it as a visual and time full medium. From there, I moved onto installation and projection works, where you walk inside of film and I treated the projection as a sculptural surface. In doing so, I could play with time and the interaction of people. Those works began in the 70s. Then I began working with more diverse materials: kinetics, pumps and air compressors. By this time, I was involved in galleries in New York, LA, Toronto, Vancouver, Japan, Holland, Germany and England. 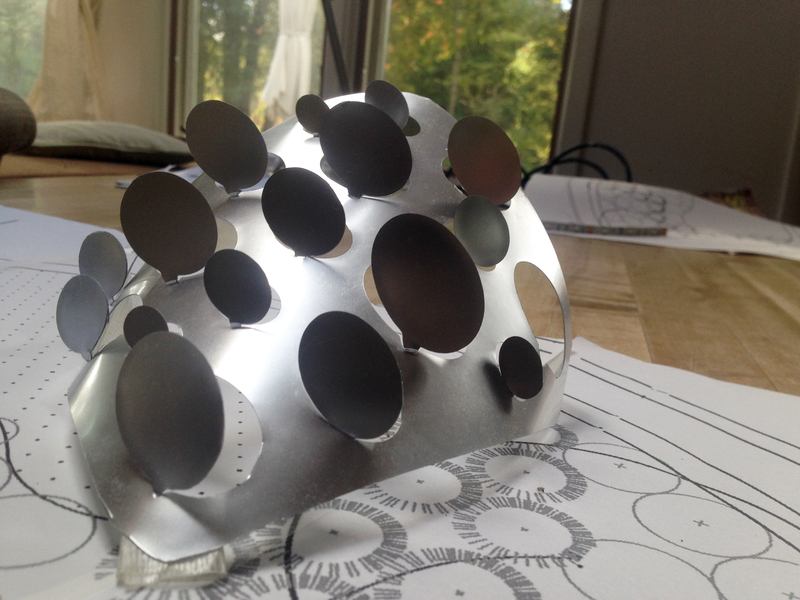 RMG: What was your inspiration for your public sculpture at the GM Centre? NH: When you approach a competition, you approach it with a pragmatic consideration, you read and see what is being requested. You are responding to a desire on behalf of the funder or organization. Which is your starting point, in a way it dictates the way you think. I like to look at how the location’s identity is operating, where its physicality sits, where its actions of energy are, how it is populated. There is an effort to extracting the site and looking at its needs. 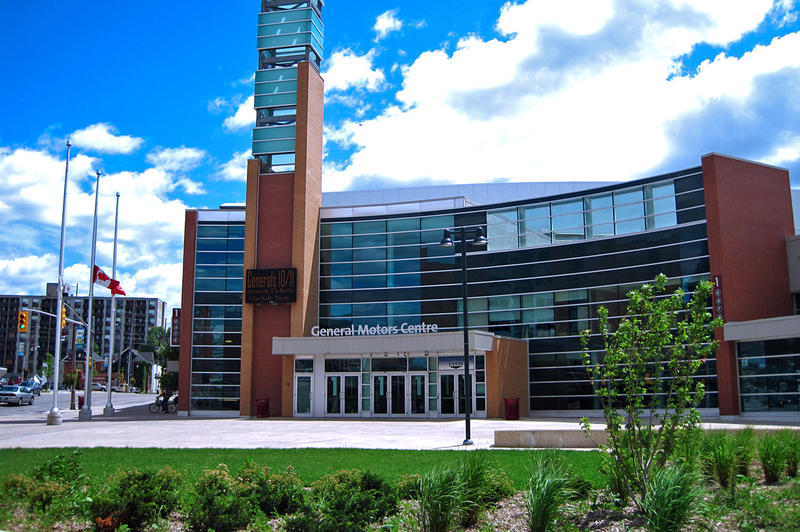 The GM Centre is an auditorium, a place where people gather regarding numerous events of community interests. As such, the work required itself to cooperate with the public use and enhance the location. We are not taking about meaning at this point, other than how you frame your movement forward with a set of ideas. RMG: What was your process for creating the concept of the sculpture? Can you explain the idea if the “blurbs” and how they relate to the final piece? NH: If you look at the detailing in the work, you’ll see a number of what we call “blurbs”, like the speech bubbles one sees text in a comic book. Those are references to the audiences inside but also, to the community of Oshawa. They are not filled in, but abstract enough to allow diversity of opinions and views and, you might say, the intensity of an array of feeling – a reference to the emotions of audience. It’s hard to say how you get an idea, you wait to see something – you’re playing. The blurb kind of kept coming after me. You try diverse elements; you model them up on paper, put them on a table and you start to either like it or dislike it. In most instances, it just doesn’t carry and you throw it away. Something evolves until a click occurs. RMG: Please tell us more about your choice of materials for this project. NH: I’ve been using stainless steel for my last few works. Its permanence makes it ideal for outside installations. Its ability to appear and disappear, because it is reflective, is really a great advantage. I cut a blurb out of a flat piece of paper and curved it up. 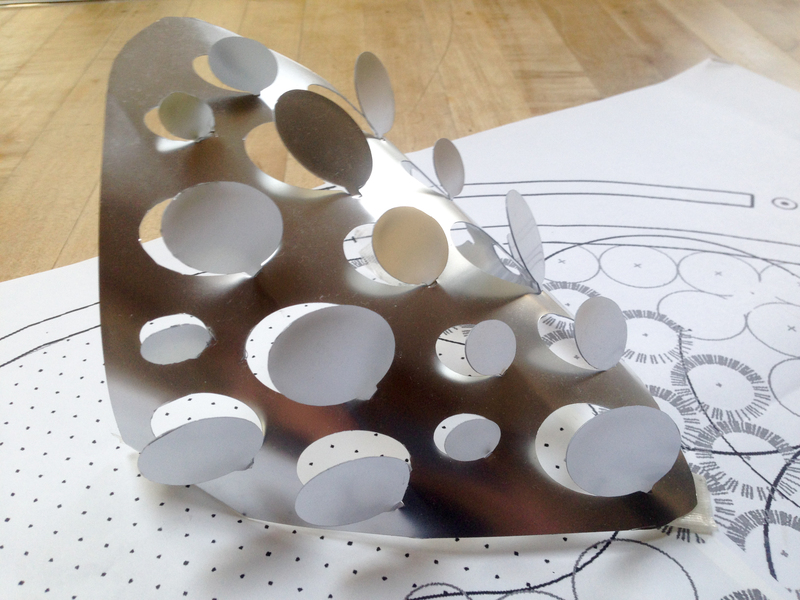 Then something was starting… and then you start to see the shapes you can read in a sculpture. There’s another element, I think of my work as making a personality rather than making a thing. What I mean by personality, is a thickness of character or meaning. As complex as a personality can be to build: humour, seriousness, interactive engagement. RMG: Lights will animate the sculpture at night. Can you please explain how? NH: I was on the site and I noticed that there was a hockey game going on inside but you couldn’t tell what was going on outside. It was quite a moment of inspiration. You go to the site to inspect it and realize it’s all dark at night, even though there are 1,000 people inside. How is this possible? If I could bring the energy of what’s going on inside, outside to the sculpture, then I’ve got a very interesting way of bringing the audience into the work. The lighting then became responsive to the activities that go on inside the centre. When there is a concert, a hockey game, or other activities, the microphone picks up that sound and influences or programs the lighting outside. As a conical shape, you might say there’s an inside and an outside to the work, that shape holds light within it and reflects where the blurbs are, giving it a kind of life. RMG: The shape of the sculpture is very inviting – what was your thought process behind it? NH: The shape evolved as a direct result of the GM Centre being an arena. The shape mimics an arena podium. You could also suggest that it appears as a stage, or a goalie’s net or a hockey mask. It is the best response to a work when people describe different images as they are then bringing their definitions to it. It’s what is fascinating about a work in that it can be interpreted differently depending on the viewer. I like each work to link to its location. This location was rich in providing stimulus to present an idea. The work faces the GM Centre entrance, it operates in an interesting way for the audience because normally you’d stand inside the work as a performer looking outward, but the way the mirrored surfaces of the blurbs works is if you’re outside you see yourself as the performer inside. It creates a strong interactive dynamic. I can see people wanting to play in front to see the light and their image moving. RMG: We are very excited about this project; can you let us know what else you are working on to make it a reality? NH: We have just completed stamped structural drawing and detailed shop drawing which in a way take longer than the actual physical creation of the work. We have ordered the shipments of steel and are within days of being able to prefabricate the components. Stainless steel has some great advantages but it is an extraordinarily labour intensive process to gain a nice even mirrored or polished finish. It is terribly consuming and requires an enormous skill base. You really have to respect the process and the people you work with. We will be doing some pre-testing of the sound equipment before it is installed. We are beginning light programming now. As well, we are working on all the pre-production planning for the site work, which will be longer than usual, in part, because it has to be broken down into numerous components, which then need to be polished on site. We will be onsite for a month actually placing the work. RMG: What do you enjoy most about working in the public realm? NH: What I love about the public realm, it’s that it’s obvious. It’s such a beautifully free space to work in, you’re not arbitrated by curation in the same way. Noel Harding produced video art in the 70’s, video projection and installation in the 80’s, kinetic installations and sculpture as theatre in the 90’s. His work for the last 20 years is in public art where landscape and environment are paramount. His work is an engagement in public urban realities: planning, envisioning, and mapping. He has exhibited and lectured internationally and his work is included in collections at the Vancouver Art Gallery, the National Gallery of Canada, the Art Gallery of Ontario, the Museum of Modern Art in New York, the City of Amsterdam and the Hara Museum, Tokyo. The Robert McLaughlin Gallery (RMG), in collaboration with the City of Oshawa, is excited to announce that artist Noel Harding will be commissioned to build a site-specific sculpture in celebration of the City’s participation in the TORONTO 2015 Pan Am/Parapan Am Games. The sculpture will be installed in the spring of 2015, adjacent to the General Motors Centre (GM Centre), Durham Region’s premier sports and recreation facility, and the venue of the boxing and weightlifting events at next year’s TORONTO 2015 Pan Am/Parapan Am Games. The final commission consists of a $150,000 budget, which includes all fees, materials, fabrication and installation costs. The cost of the commission will be provided through the RMG’s restricted Acquisitions Endowment. “The Selection Committee was impressed by Noel Harding’s submission that shows a real understanding and appreciation of the site and intentions of the project. The RMG is thrilled to be able to facilitate this exciting addition to our downtown,” said Gabrielle Peacock, Chief Executive Officer of The Robert McLaughlin Gallery. As an artist, Noel Harding produced video art in the 70’s, video projection and installation in the 80’s, kinetic installations and sculpture as theatre in the 90’s. His work for the last 20 years is in public art where landscape and environment are paramount. In general, his work is an engagement in public urban realities: planning, envisioning, and mapping. He has exhibited and lectured internationally and his work is included in collections at the Vancouver Art Gallery, the National Gallery of Canada, the Art Gallery of Ontario, the Museum of Modern Art in New York, the City of Amsterdam and the Hara Museum, Tokyo. Visit the artist’s website. The commission installation is set to take place by May 15, 2015 and the RMG will be posting updates about the commission as it develops. Please visit http://www.rmg.on.ca/gm-sculpture-commission.php for more information.